Pipe tobacco is really divided into main two groups – Ready Rubbed either mixtures or aromatics and Flake. Virginia – flue-cured resulting in a bright yellowy orange coloured tobacco. This is a process where the tobacco is subjected to smokeless heat being forced into it. Virginia tobacco forms the main constituent of many Mixtures and Aromatics. Burley – Originally discovered by George Webb in 1864, it forms the base of many aromatic blends. As it burns quite slowly, it helps to compliment quick burning blends. Latakia – A black coloured sun-cured tobacco from Turkey, Syria and Cyprus which has been hung over wood fires in sealed barns – different types of wood give the Latakia different flavours. Adding it to a blend gives it a much fuller flavour. 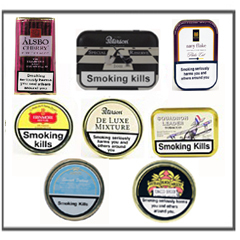 Perique – is an aromatic tobacco with a pungent flavour which is not produced in very large quantities. It is full bodied and used very sparingly in blends. Cavendish – is a mixture of different leaves that have been flavoured and pressed into cakes. Black Cavendish – forms the base of many aromatic tobaccos. It is a sweet, dark, air-cured tobacco with a full-flavour. The vast majority of pipes, which come in all shapes and sizes, are made from the root of a small shrub that grows in the countries that border the Mediterranean Sea. The ‘briar’ which is very hard and does not burn readily - is taken from the ground as a large root mass to the mills where the best quality is selected. It is then cut into small blocks, set in boiling water to remove the sap and resin before it is then dried over a period of several years. This process ensures that any remaining sap and resin is removed. The small blocks are then ready for the pipe-makers to begin the process of creating a pipe. The cost of a pipe is determined by the quality of the briar, the way the grain runs and also and the amount of workmanship involved. 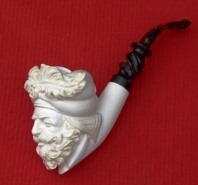 The first few times that a new pipe is used, the experience may be somewhat tainted, so it is essential to persevere until the pipe is ‘broken in’. Once the air flow has been tested by blowing down the empty pipe, it will be necessary to build up a carbonised lining to the bowl interior. This will be achieved by smoking about half a dozen half bowlfuls. As this lining will thicken over the months, keep this layer to about 1/16th of an inch by regular trimming. Once the pipe has been ‘broken in’, it is time to fill the bowl. It is very important that the filling process is done in a proper manner because if done incorrectly the pipe may burn hot and bitter. First, the bowl should be held upright and add some tobacco until is just overflowing. Tamper this down gently and repeat until the bowl is full and the tobacco has a nice springy feel. Check the draw each time the tobacco is pressed into the bowl. Lighting the pipe, as with cigars, should not be with petrol lighter but either a match or a gas pipe lighter. The first step is called the charring light and the purpose of this is to create a charred lid of tobacco. This is done by moving the flame around the tobacco to ensure that it is completely ignited. Once completed, tamp the charred lid gently and as you puff slowly, apply the second light to the tobacco – you are now ready to enjoy your smoke. You may have to relight the pipe several times but this is quite normal. The tobacco may produce moisture as a result of the combustion and in some cases the pipe smoker may produce excess saliva. In both instances, run a pipe cleaner down the air hole. It is very important to maintain your pipe in tip-top condition - how long your pipe will last will depend on this. 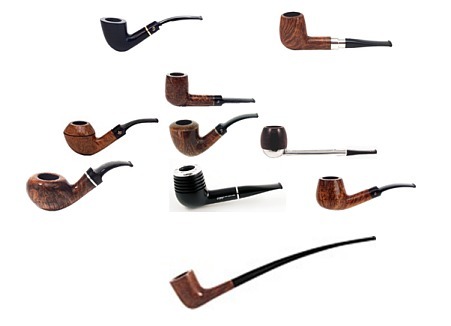 A pipe for every day of the week may be desirable but two or three pipes are better than just one. Never refill the bowl whilst it is still warm, clean the air hole regularly with a pipe cleaner and carefully shave off any excess carbon in the bowl with a smoker’s knife or a reamer when necessary.